January 27, 2013 | David S. Maldow, Esq. Zoom.us is a relative newcomer to the desktop/mobile/cloud videoconferencing space and has quickly made a name for itself by providing a business quality desktop experience with exceptional ease of use, at no cost. It was only a matter of time before they added a paid plan including a full suite of business features and capabilities. 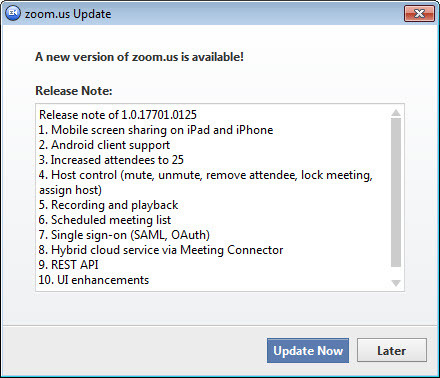 This week at Macword/iWorld, Zoom will be demonstrating their new UME (Unified Meeting Experience) offering. UME includes a list of new features and enhancements, including a few impressive industry firsts. We spoke with Nick Chong from Zoom to get the full story. Let's start with the pricing. First of all, the EDU plan for 99 cents is so clever from a business development perspective that it doesn't even require explanation. Second of all, the word "disruptive" may be terribly overused in our industry, but at $9.95 a month, this is undeniably consumer level pricing, and competitive consumer level pricing at that. Users can continue to make person to person Zoom calls at no cost, but will need the new plan for multipoint (similar to the Skype business model). Current users, who have been enjoying unlimited multipoint, will face a slightly unpleasant reality on March 1st, when the new limitation kicks in. However, at that point they can easily upgrade for $9.95 a month to regain their unlimited multipoint and start enjoying all the new features and capabilities. So what do we get from the upgrade? There is so much included here that in reality this is almost an entirely new offering. Nick helped to explain it all by describing the new Zoom UME as a 3 in 1 offering, including all of the expected features for; 1) an HD videoconferencing solution, 2) a full featured mobility offering, and 3) a complete web meeting platform. One capability that I find particularly interesting is the ability to support multi-screen desktops. Like many people, I have two monitors on my desk. With most competitive desktop solutions, when a remote party shares content with me (such as a PowerPoint), the content takes over my main display and the presenter either disappears, or is reduced to small thumbnail video. The new Zoom will support my two monitor setup so that I can easily display the videoconference on one screen, and any content being shared with me in the other screen. This is a very cool, forward looking, feature. The second main element of the UME package is its impressive mobile capability. Generally for these types of solutions, the mobile app will be a lighter, less powerful, less flexible, less capable, version of the desktop offering. Not so with Zoom. This is truly a full featured mobile solution. We all appreciate the ability to simply attend a videoconference on a mobile device, when desktop is not available. Zoom allows us to do everything we could do from the desktop, with the exception of recording. Most importantly it is the same UI, with the same ease of use. The new Zoom mobile client includes one power feature worthy of separate discussion, and that is the ability to share screen from the mobile site. According to Zoom, they are the first to get this capability approved by Apple and the only one to currently support it. A Zoom mobile user can share Dropbox docs, websites, and pics stored on the iPad. This is extremely cool and opens up a number of possibilities. It may not be likely that you will soon be stuck in a hotel room with just an iPad and need to give a PowerPoint presentation over VC, but not all use cases are so extreme. Sharing pictures, websites, and documents is an essential element of a desktop videoconferencing solution. If we truly believe that tablet videoconferencing can be a real business tool, then why wouldn't we want share capabilities there as well? The mobile share is an inherent Zoom capability, regardless of free or paid status. I performed some quick testing and it was worked very well. Most importantly, it was extremely intuitive and easy to use. It may be a power feature, but it isn't limited to power users. "Web Meetings" is one of the more loosely defined terms in the industry. What Zoom is really talking about here is the layer of business features and capabilities that turn a simple videoconferencing app into a business class video meeting solution. UME hits all the high notes, offering users full meeting moderation controls (see above), the ability to create scheduled meetings and standing meeting rooms, advanced chat functionality (private and group), and other capabilities. One huge new power feature is recording, and it is available in all Zoom calls, free or paid. Recording can be expensive, complicated, and is often just unavailable in typical videoconferencing environments. 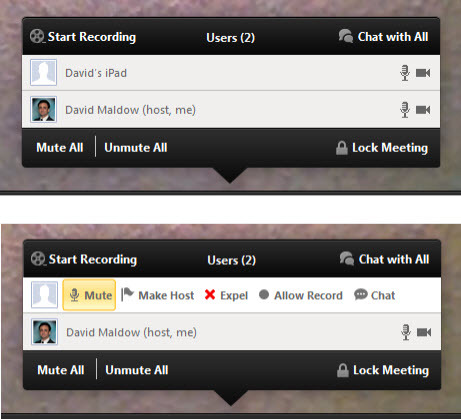 Users are often frustrated to learn that it isn't a simple matter to record their meetings. Some solutions allow recording but limit by file size, etc. Zoom records and stores recorded content locally on the user's desktop, so there are no bandwidth or storage concerns. Another option for the power users is the availability of a new hybrid cloud service offering. Zoom's new "Meeting Connector" is software, installed locally, behind your firewall. All local traffic within your organization is routed through the Meeting Connector, without having to go out to the public internet. Obviously, keeping local traffic local results in a higher quality, lower latency, video experience with less external bandwidth use. The connection between the Cloud and the Meeting Connector is seamless and is all hidden to the users. Finally, Nick spent a fair amount of time describing Zoom's due diligence in regards to security. A major hurdle for an enterprise ready solution is compliance with internet security requirements. Bottom line, Zoom reassured us that they can meet industry security expectations. As exciting as this announcement may be for the Zoom team, they still have some work ahead of them. The solution still lacks any way to connect outside of the Zoom world. This may be a minor issue, as anyone, anywhere, can simply click a meeting link on any device and jump right into a meeting, but it is an issue nonetheless. The most basic way to open up the Zoom world would be to allow PTSN (telephone) dial-in connections. This ability is a common, and heavily used, feature on competitive platforms. In my opinion, this is one feature that is "missing" from the current Zoom offering. Ideally, Zoom shouldn't be satisfied with telephone connectivity, and should also be offering connectivity to legacy videoconferencing systems (H.323/SIP). This could truly be a game changer, as Zoom would then not only be a threat in the desktop/mobile/cloud world, but would be a player in the growing interop cloud service market. According to Zoom, both telephone and legacy VC interop are on the roadmap for late 2013. I hope the competition is on its toes, because things are getting interesting and Zoom is moving as fast as their name indicates. Let's start with the pricing. First of all, the EDU plan for 99 cents is so clever from a business development perspective that it doesn't even require explanation. Second of all, the word \"disruptive\" may be terribly overused in our industry, but at \$9.95 a month, this is undeniably consumer level pricing, and competitive consumer level pricing at that. Users can continue to make person to person Zoom calls at no cost, but will need the new plan for multipoint (similar to the Skype business model). Current users, who have been enjoying unlimited multipoint, will face a slightly unpleasant reality on March 1st, when the new limitation kicks in. However, at that point they can easily upgrade for \$9.95 a month to regain their unlimited multipoint and start enjoying all the new features and capabilities. \"Web Meetings\" is one of the more loosely defined terms in the industry. What Zoom is really talking about here is the layer of business features and capabilities that turn a simple videoconferencing app into a business class video meeting solution. UME hits all the high notes, offering users full meeting moderation controls (see above), the ability to create scheduled meetings and standing meeting rooms, advanced chat functionality (private and group), and other capabilities. Another option for the power users is the availability of a new hybrid cloud service offering. Zoom's new \"Meeting Connector\" is software, installed locally, behind your firewall. All local traffic within your organization is routed through the Meeting Connector, without having to go out to the public internet. Obviously, keeping local traffic local results in a higher quality, lower latency, video experience with less external bandwidth use. 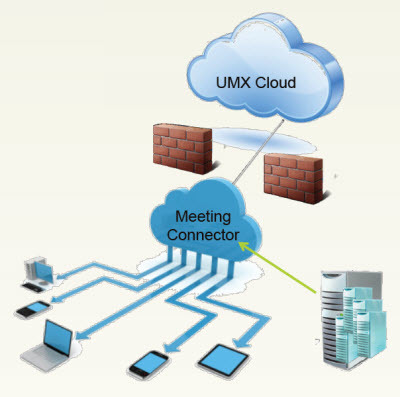 The connection between the Cloud and the Meeting Connector is seamless and is all hidden to the users. As exciting as this announcement may be for the Zoom team, they still have some work ahead of them. The solution still lacks any way to connect outside of the Zoom world. This may be a minor issue, as anyone, anywhere, can simply click a meeting link on any device and jump right into a meeting, but it is an issue nonetheless. The most basic way to open up the Zoom world would be to allow PTSN (telephone) dial-in connections. This ability is a common, and heavily used, feature on competitive platforms. In my opinion, this is one feature that is \"missing\" from the current Zoom offering.